Peru is one of the great originating centers of ancient culture, and on this vacation, you’ll discover its archaeological treasures, visit its ancient ruins, and learn about its ancient culture. A highlight of your vacation is a tour to Machu Picchu, where you’ll visit this amazing Inca city. Stand in awe as you witness the ancient ruins surrounded by soaring peaks—one of the most majestic images in South America! Also, see the Temple of Sacsayhuaman, which was built in the early 12th century. Some of the stones used to build the fortress weigh more than 350 tons, and the stones were fit so tightly together that a piece of paper will not fit between the stones. Try to figure out how it was built without the help of modern technology and machinery! While at the ruins, experience a Mother Earth ceremony by a local shaman to thank Mother Earth and to ask for good health and safe travels. Of course, no trip to Peru is complete without seeing the Nazca Lines. When seen from the air, the lines form precise geometric shapes that number in the hundreds, as well as 70 figures, which include a monkey, whale, hummingbird, shark, spiders, and plants. Archaeologists remain puzzled about why the ancient Nazca people, who thrived here from 200 BC to 500 AD, created illustrations that could only be seen from far above the earth.These are just some of the many highlights you’ll see on this wonderful Peru vacation. For travelers ready for a new adventure, this tour is not to be missed! Day 7: CUSCO–JULIACA–PUNO (LAKE TITICACA). Day 8: PUNO. EXCURSION TO LAKE TITICACA. 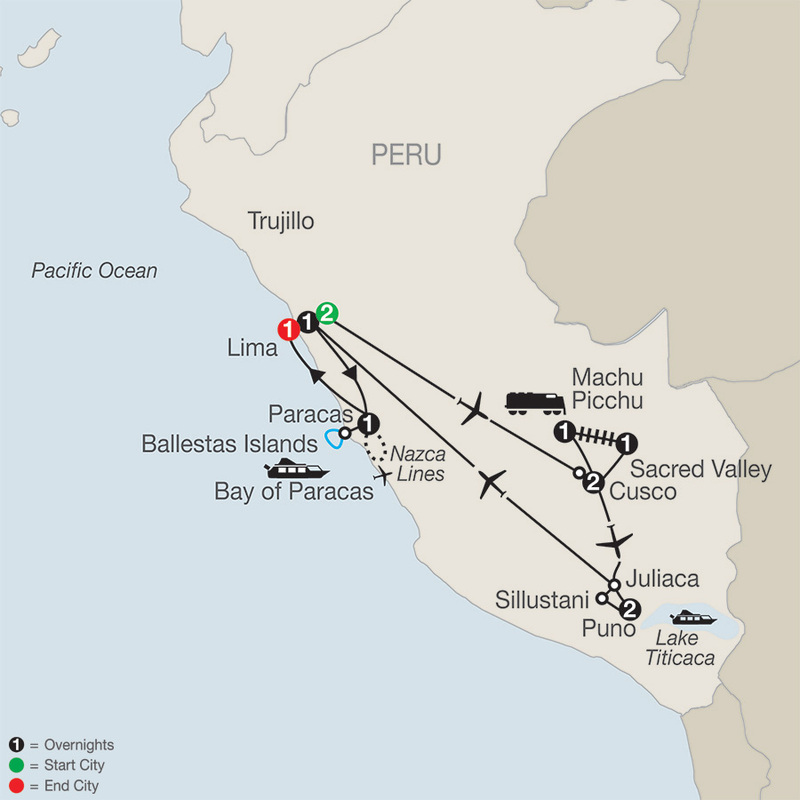 Day 10: LIMA–PARACAS. BALLESTAS ISLANDS CRUISE & NAZCA LINES.